Learn how you can make the most of your Valley Gives profile in 7 easy steps! Add Your Organization's Info - Here's where you can enter in a little more information about your organization, including a tagline (75-character limit) and selecting up to three causes that align with your organization. 2. 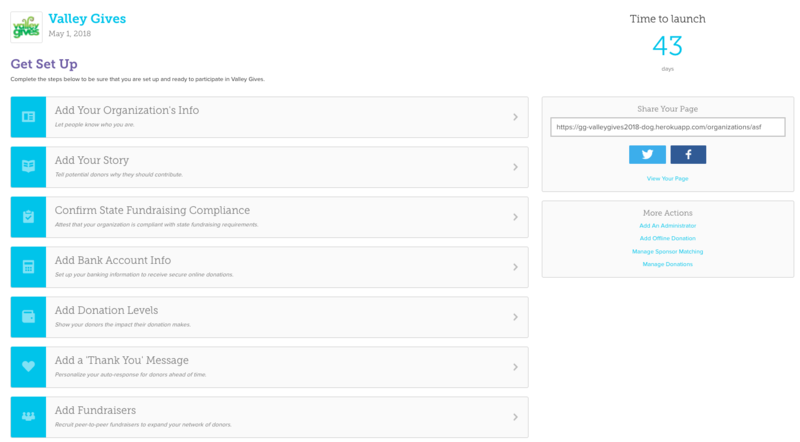 Add Your Story - This is a section where you can really highlight your organization's mission. You can also choose to include a monetary goal for your Valley Gives 2018 campaign if you'd like to as well as your own photos and content. 3. Confirm State Compliance - This is a self-attestation that your organization complies with fundraising requirements in the states that you are soliciting donations. If you have questions, take a look at the resources in the link or head to Harbor Compliance to learn more from compliance experts. 4. Add Bank Account Info - GiveGab will disburse all funds raised within 1-2 business days via direct deposit. For this, you will need to ensure that your organization's legal business name and EIN number is correct. You also need to enter the first and last name, birthday, and last 4-digits of the SSN of one of your organization's representatives. We do not store any of this information, but it is securely verified by Stripe to make sure your organization is legally authorized to accept tax-deductible donations. 5. Add Donation Levels - This is an optional feature, but it helps donors visualize the impact their donation will have on your organization! 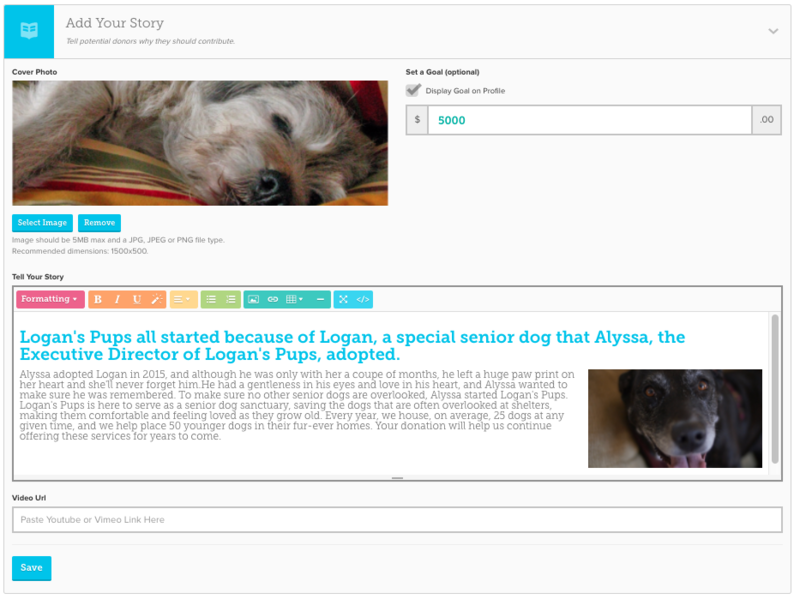 You can add multiple donation levels and include a brief description. 6. Add a 'Thank You' Message - This message will appear at the top of the receipt your donors receive immediately after making their donation. You can add a nice photo or video to personalize it even more! 7. 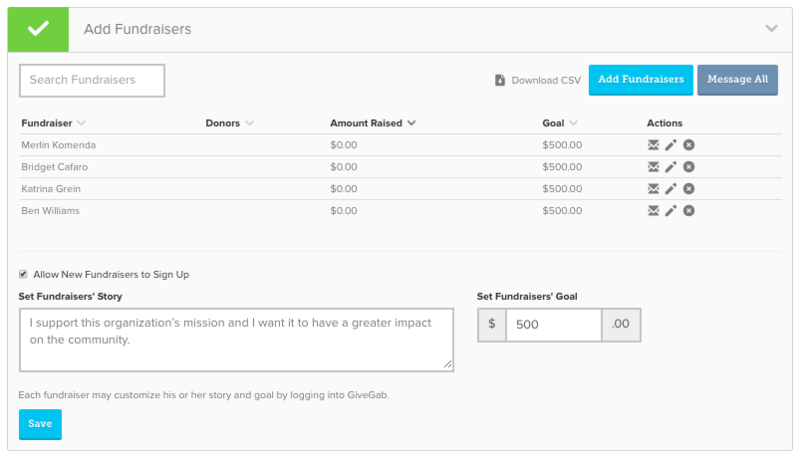 Add Fundraisers - You can easily add and manage your peer-to-peer fundraisers right from your Giving Day Dashboard! Simply add their name and email address, and you can help your supporters create their own fundraising page for your organization. Your profile is now complete! If you want to learn more about each section, remember to check out our Giving Day Profile Cheat Sheet or if you have any questions, please chat with us! We can help with anything and everything from uploading an image to offering online fundraising best practices. Just click the little blue chat bubble on the bottom right-hand corner of your page anywhere on GiveGab or on the Valley Gives website!